Many people suffer from depression and sorrow. Many take pharmaceutical antidepressants and regularly go to clinics to receive therapy. Of course, for some, it may involve issues based on heredity and diet. For many, it entails accumulated psychological problems. Most, when they were much younger, did not have such issues; in youth, they were filled with wondrous curiosity and inner vitality. Many, as they age, become jaded and unhappy, bored with the same-old-things and with the monotony of it all. A large part of the problem lies in wrong education. Most, throughout their education, were not encouraged to be keenly aware of their own minds… to be aware of the essence of thought and thinking and to explore beyond the realm that thought and thinking manifest as. Most, from society as it currently is structured, were taught to cherish and exclusively dwell in the process of thinking… in mostly math and reading and such, and not so much with wholeness and integrity. Few were encouraged, in their youth, to question everything and to be free from mere standard ways/procedures. These days, almost all of us are immured within the walls of thought/thinking. Most exclusively dwell in (and “as”) thought/thinking… and very few value going beyond that domain. Most have put all of their eggs into that one basket; in that, they dwell. That basket is like a small, limited prison. Many minds are imprisoned (i.e., deeply embedded) in dogmas, beliefs, presuppositions, antiquated systems, and isolating boundaries. As one has said so many times before, thinking is always symbolic, always second-hand, limited, and merely representational. Yet so many cling to thinking and unquestionably exist almost exclusively as what it is. Even when most of us look at things, we are looking with (and through) the screen of thinking; such thinking involves labeling, categorizing, classifying, identifying, and pigeonholing. When most look at things, they are primarily looking with the memory bank (i.e., through retained knowledge). Such a memory bank is from the past and is always old, always of stored data. They look with (and from) the stored (old) past… and they inevitably get bored while they feel stale and full of the mundane. With this situation, antidepressants and clinical so-called experts can only help so much. One of the functions of the human mind is to be of order and to transcend sorrow; transcending sorrow is, in itself, order. A mind of deep awareness can often look at things without merely using the storehouse of old and stuffy memory. To perceive without relying on the storehouse of dead memory (and stale patterns of remembrance) is a living art. There is no method to this art. It does not involve old patterns that you can absorb or practice to improve yourself over time. Using thought when it is necessary but often going beyond it, the wise mind sagaciously realizes that profound bliss is not a mere remembrance. Profound joy is not labeling everything and then looking at everything through (and “as”) dead labels. To perceive without the burden of the past is real living. Real living is not the past perpetually relabeling things (with endless symbols) into the present and future. The mind that goes beyond “perception through mere symbolism and fragmented mental constructs” is a liberated, whole, free mind full of joy. I’ve never seen such a tangled vine. It’s delightful. When our thoughts take on that shape, it’s not always such a delightful experience. Yes, Linda, it is quite tangled! There is a short, small poetry book, by R.D.Laing, called “Knots,” that is brought to mind here. Although all you say is true and worthy of our consideration, we must not leave out the fact that depression (mental illness) can, and often is, the result of chemical imbalance in the brain. We just finished National Suicide Awareness week. We must be aware that depression can be a fatal illness. 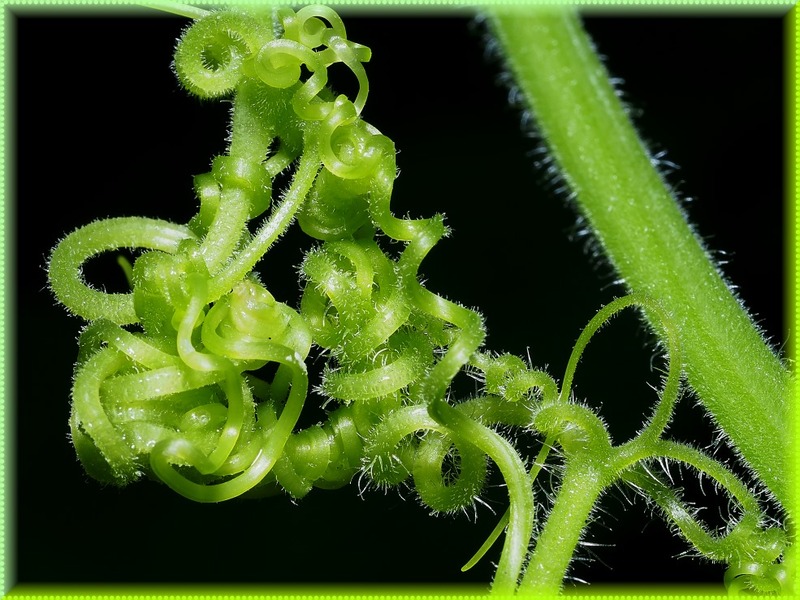 Incredible tangle in your image – superb macro photography! This post reinforces the goal to bring “beginner’s mind” to all moments and encounters – to look w/o filters and preconceptions at what’s happening now, taking in as opposed to labeling. I understand depression from close encounters – no easy solution that works for all, but opening to possibilities is the first step toward resolution. I don’t call it “beginner’s mind” because beginning has nothing to do with it. It really is a timeless thing (though “thing” is not right either). In the past, i’ve been around a good number of people with depression. Miseducation and a whole lot of factors influence the human brain. Unfortunately, it seems, very stable minds are very few and far between. Thanks, Mark! 🙂 We can’t have an orderly society unless (internally) our minds are of great order. Great post/photo combo, love that tangled knot Tom! Much appreciated, Donna! 🙂 Like was mentioned to Mark, we can’t have an orderly society unless (internally) our minds are of great order. I know, all those tendrils and they grow fast as well. I had a neighbor who had an arbor with a wisteria vine on it. The arbor broke apart and the wisteria was not doing well (or so she thought), so she just let it grow against/up the chain link fence. It became almost invasive and wound itself around my lilac tree. I have to go out there a few times each Summer and just pull all the winding vines off the lilac as it literally chokes it! I think you’ve put a lot of “thought” into this piece. 🙂 I enjoyed reading your wisdom and the image was perfect for it. This piece was interesting and I enjoyed reading it, but in my opinion it’s not very easy for most people to apply this advice in the real world. If I might add some small observations; in my experience the best cures of almost all depression and anxiety are kindness, generosity and having an aim in life.